At the invitation of The Western Front, Vancouver, Other Sights presented a three-part artwork created for Urgent Imagination: Art and Urban Development, a multi-site public art exhibition and 2-day conference that focused on development in the Mount Pleasant neighbourhood. 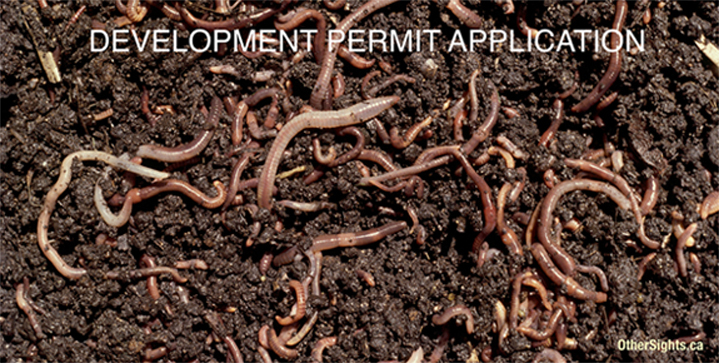 Slow Dirt responded to the accelerated, often manic, conditions of real estate development in east Vancouver by focusing on the slow, deep and generative production of the humble earthworm. Bearing characteristics and employing methodologies that are worthy of emulation, the earthworm creates ’surplus value’ on a sustainable timetable. It is sensitive to the local, immersing itself in the underlife and lifespans of the city and all that grows there. Cascading from the roof of the Western Front, an enormous inflatable presented a buoyant, celebratory figure to inspire a development that brings ecological riches, an awareness of mortality and a manageable pace to our urban spaces and lives. Al McWilliams has exhibited extensively in both solo and major group exhibitions throughout Canada the United States and Europe. He has represented Canada in exhibitions in Germany, France, Japan, Korea and the United States. His work is held in most major public collections in Canada including The National Gallery, the Vancouver Art Gallery, the Art gallery of Ontario and the Musee D’art Contemporain. 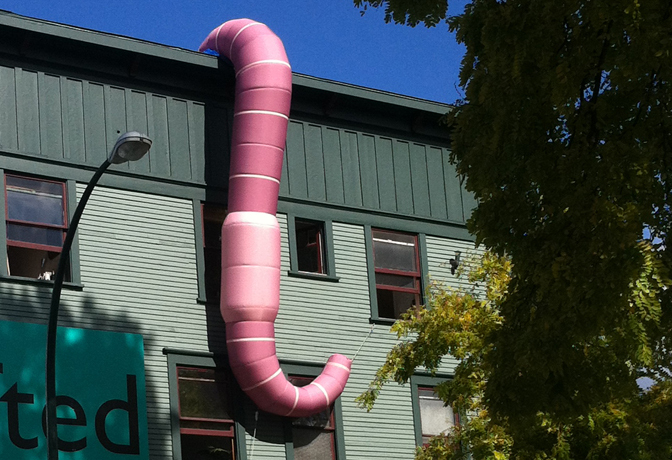 Along with his private studio practice Al has been involved in a number of public art competitions completing works in Toronto, Vancouver, Seattle and Japan. His last public project was the Monument for the Royal Canadian Navy in Ottawa. Al is represented by the Equinox Gallery in Vancouver and TrepanierBaer Gallery in Calgary. Meredith Quartermain is a poet and fiction writer whose most recent book is I, Bartleby, a book of stories, which contains the piece “How to Remember.” Her other titles include Rupert’s Land: a novel, Recipes from the Red Planet (shortlisted for a BC Book Prize for fiction), and Vancouver Walking, which won a BC Book Prize for poetry. She is currently the Poetry Mentor in the SFU Writer’s Studio program. Other Sights gratefully acknowledges the support of the British Columbia Arts Council and CUPE 15. Special thanks to Caitlin Jones and Ben Wilson at the Western Front, Clint Burnham for suggesting Quartermain’s poem, Maggie Boyd for illustration, Dan Sundvick for engineering, Stuart Sproule and Tyson Longworth for installation, Brian Charleston, Karen Henry and Bryan Newson at the City of Vancouver, and Richard Yeung for flyering.